Windsor Castle, the largest and oldest occupied castle in the world, is one of the official residences of Her Majesty The Queen. The Castle’s dramatic site encapsulates 900 years of British history. It covers an area of 26 acres and contains, as well as a royal palace, a magnificent chapel and the homes and workplaces of a large number of people. The magnificent State Apartments are furnished with some of the finest works of art from the Royal Collection, including paintings by Rembrandt, Rubens, Canaletto and Gainsborough. Edward The Confessor frequented a Saxon palace at Old Windsor, by the side of the Thames, and held his Court there at times; the manor he gave, for the good of his soul, to the abbot and convent of Westminster, but it was exchanged by them with William I. for Wokendom and other lands in Essex, and the old palace was used for nearly half a century after the Conquest whilst the new castle was building. The site of it is not verified, but it probably stood to the W. of the church, and close to the river, where until of late years existed a farmhouse surrounded by a moat that was fed by the Thames. The Conqueror, searching everywhere for places of vantage whereon to erect strong castles, proceeded to build one upon the brow of a hill, two miles N.W. of the old palace—a striking eminence which Saxons or Danes may have previously chosen—where at all events there is a burh mound. Nothing, however, is known of its beginnings, except that William was there in 1070, and that the castle is mentioned in the Domesday Survey of 1086. It was sufficiently strong in 1095 for the Red King to employ it as the prison of Robert de Mowbray, Earl of Northumberland, whom he had brought south from Bamborough (q.v. ); and from this date until the Commonwealth it continued to be used as a State prison. Henry I. having completed “many fair buildings”, including a chapel, in addition to what he found, kept his Court at the new Windsor Castle for the first time at Whitsuntide, 1110. 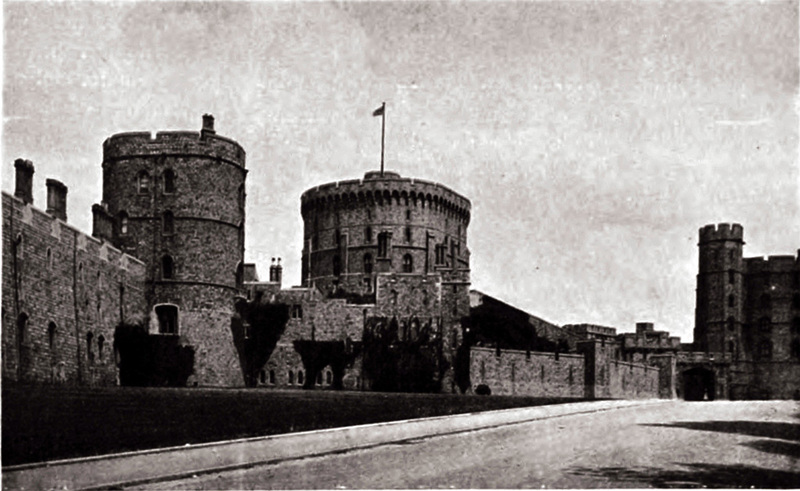 There does not appear to have been any contest for its possession during the wars between Stephen and the Empress Maud, which lasted for nineteen terrible years; but upon the peace, Windsor was esteemed the second fortress in the kingdom, and was, with the Tower of London, committed to the custody of Richard de Lacy. Henry II., on his return from Normandy, held his Court here at Easter, 1170, when the King of Scotland, William the Lion, with his brother David, came to welcome him; he resided here frequently till his death in 1189, before which he caused to be painted “in a chamber at Wyndesore” the representation of a dying eagle attacked by four young ones, to show his sense of the conduct of his four rebellious sons. Prince John seized on Windsor, with Nottingham and other fortresses, during the imprisonment of his brother, the King, in Austria, but was forced to give it up to the barons, who laid siege to it in Richard’s name. He came there soon after his accession to the throne, and frequented the castle much during his evil reign. In February 1210 he left it to pursue the wife and son of William de Braose, the powerful lord of Bramber (q.v. SUSSEX) and many other castles, against whom he had a claim for the rent of lands in Ireland. Some accounts give as the cause of the King’s violence a defiant reply of the Countess Maud, his wife; at any rate, on their fleeing to Ireland, he pursued them thither and captured them. The wife of Braose, with her son and his wife, daughter of the Earl of Clare, and their two sons, with Braose’s daughter Margaret, who was married to one of the Lacys, were then sent prisoners to Bristol, and thence to Windsor. Fifty thousand marks (£33,333) was fixed as their ransom, to raise which William de Braose, being allowed his liberty, fled to France, and John starved the whole family to death, as some say, at this castle, though writers differ as to the number of persons thus murdered. One contemporary chronicler states (though he gives Corfe Castle as the scene) that they were shut up in a room, with a sheaf of wheat and a piece of raw bacon for their sole sustenance; that after eleven days the prison was opened, and they were found dead: the mother was sitting upright between her son’s legs, with her head thrown back on his breast, he being in a sitting posture, with his face turned towards the ground. Maud de Braose, in her hunger, had gnawed the cheek of her son, then probably dead. The deed excited strong public feeling against the King. It was from this castle that John, on June 15, 1215, attended at Runimede, a fine level meadow on the banks of the Thames between Windsor and Staines, though the local tradition gives a little island opposite to this place as the scene: but the words of the charter are “in prato”. The conference occupied nine days, and it is likely that John attended each day, returning to his castle (where the barons would not go) till all was settled. In a few weeks this monstrous King broke his faith, and supported by a strong force, set at nought the barons who could not combine against him. He took Rochester Castle, and then ravaged the North with fire and sword. In despair, the barons sought aid of Louis, King of France, and John, hearing of the intended invasion at Windsor, left for Guildford Castle. He never set foot in Windsor again. The Dauphin himself, landing May 30, at Sandwich, besieged Dover, and the barons attacked Windsor, these being the only well-garrisoned places on the King’s side. The barons met with a vigorous resistance from Falck de Brent, John’s custodian (see BEDFORD); but made little way, while the king was laying waste their estates. At one time he came near Windsor, and the barons, raising the siege, went after him. Happily he died that autumn. Henry III., his son, was a great builder, and a man of taste and refinement, under whom great progress was made in art. The Liberate Rolls of this reign detail much work of construction, which must have entailed a very large outlay. In his reign were built the Bell, the Clewer (with its prisons underneath), the Berners’, and the Almoners’ Towers on the N. side, and what were afterwards called the Garter and the Salisbury, or Chancellor’s, Towers on the S.W. ; he also completed the ditch on the W., by the removal of houses, and added a barbican. The King’s Hall was in the Clewer Tower, now the library of the dean and chapter. The royal kitchen was beyond, and further on the N. wall were the royal apartments. At Windsor in the upper bailey he built large chambers for himself and his queen, 60 feet and 40 feet long respectively, and a chapel with a wooden roof, 70 feet by 28; he caused painted windows and ordinary glazed ones to be inserted, and added to the comfort of the residence by wainscotting the walls. In 1263, in the beginning of hostilities with the barons, Prince Edward, occupying Windsor with a garrison of foreign soldiers, fortified it, and placed his wife Eleanor there for safety, the King joining him at Christmas. As Edward I., he and his Queen frequently dwelt here, and in 1278 held a grand tournament in the park, where thirty-eight knights competed. Edward’s three elder children were born in the castle. At this time there were vineyards belonging to the castle, one being in the ditch, and the cost of their cultivation and of the gathering of the grapes is recorded as an annual charge. Edward II. kept Christmas here in 1308, and in succeeding years, with great solemnity, and his eldest son, afterwards Edward III., was born in Windsor Castle, November 23, 1312, Queen Isabella being then only eighteen. Edward III. had a strong attachment to the scene of his birth, and made Windsor his chief residence, and to him the castle owes its glory and grandeur. His first work there seems to have been the Round Tower, or keep, which he reared on the lofty mound or burp, 125 feet in diameter, thrown up centuries before on this hill-top, with its protecting ditch, where the Conqueror had replaced the Saxon stockade and dwelling of timber by a girdle of stone, and a keep, to be superseded by a stronger tower about the year 1272. Edward’s shell, or annular tower, was connected on the N. with the old gatehouse admitting to the inner ward, and on the S. with that front, and so formed the fourth side of this upper ward; below it was a middle ward, which no longer exists. In the Round Tower the woodwork of that period still remains, supporting the existing floors. Edward was in his thirty-sixth year (1348) when he commenced the great work of remodelling the castle, and the building seems to have occupied twenty years; his clerk of the works was a young monk of high intellect, who was known as William of Wykeham, and who, by his talents and the King’s patronage, rose to be Bishop of Winchester. The new buildings which were added or improved during this period were the Great Hall of St. George, the lodgings on the E. and S. sides of the upper ward, the chapel of St. George, the dwellings of the custodian and the canons in the lower ward, with the whole circumference of the walls and their several towers and gates. In 1347 David Bruce, King of Scotland, who had been taken prisoner at the battle of Neville’s Cross, was brought to Windsor, and confined in one of the towers of the S.W. wall of the upper ward, where he remained for a part of the long eleven years, until his poor kingdom was able to pay the enormous ransom demanded for him of 100,000 marks, or £66,666, equal to about 11/3 millions of our present currency (1896). He was joined in his captivity in 1357 by John, King of France, made prisoner at the battle of Poictiers the preceding year by Edward the Black Prince, who was confined in the tower called King John’s. 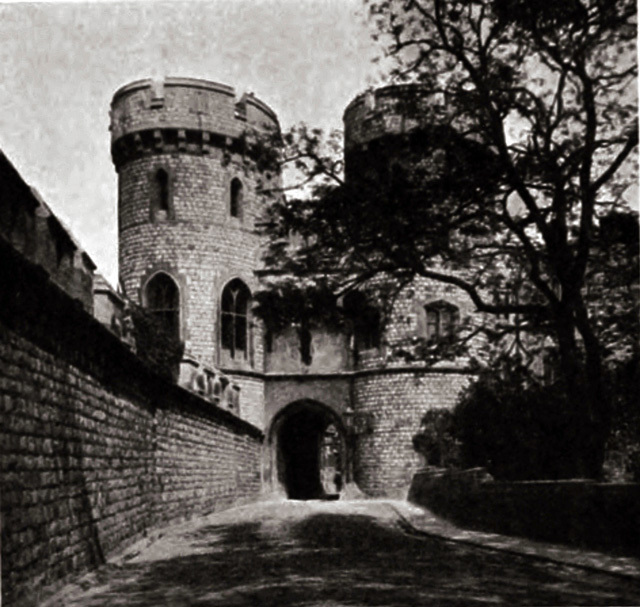 Edward allowed the captive Sovereign much freedom, but after a great tournament held here in 1358, it was found that he had abused his liberty by communicating with France, whereon he was removed to Hertford Castle, and thence the next year to Somerton Castle in Lincolnshire, and ultimately to the Tower. In 1360 a treaty was drawn up by which a ransom equal to1½ millions of our money was to be paid by France for his freedom, and John was sent back to France; but in 1363 it being found that the terms of his release could not be fulfilled, he returned to England, and was sent to the Savoy, where he soon after sickened and died. The reason for Edward’s great additions to the castle was the requirement of further space to accommodate the throng and the ceremonies entailed by his institution of the Order of the Garter. In the year 1344, influenced by some tradition of King Arthur and his knights in connection with the hill of Windsor, he had ordained certain jousts to be held there annually at Whitsuntide, to which foreigners were invited, and a great temporary building was set up, having in it a round table 200 feet in circumference, to promote equality among his guests. The days were spent in tournament and feats of arms, and the nights in balls and dancing. This seems to have led to the institution of the great Order, which Selden says “has precedence of antiquity before the eldest rank of honour of that kind anywhere established”. It was founded upon a high principle for the promotion of honour and nobleness, its patrons, besides the Trinity and the B.V.M., being St. George of Cappadocia, champion and martyr, and St. Edward the Confessor, the number of its members being limited to twenty-six knights, and Papal sanction being obtained for the scheme. The commonly received origin of the motto and emblem may be wholly or in part apocryphal, and is certainly not in keeping with the solemnity of the subject. Polydore Vergil was the first to give the common story (temp. Henry VII. ), and Froissart’s account of the romance after the siege of Wark Castle in 1342, when the King fell in love with the beautiful Catherine, Countess of Salisbury (see WARK, NORTHUMBERLAND), and subdued himself, only redounds to his honour. Apart from the story of the chopped garter, Edward himself had given his own garter in 1346 for the sign of battle at Crecy, and the object may have been taken as a symbol of union, or to represent the round table instituted by him two years previously. It was an age of “impresses, mottoes and devices”, Edward himself being peculiarly devoted to them. The formal institution of the Order did not take place till after the return from Crecy, early in 1348, when we first read of the King’s robes and Orders being made, containing the garters and motto. As for the motto itself, which is made to refer to the attachment of the King to the countess, Sir Harris Nicolas points out that the proper translation of the words, “Honi soil qui mal y pense”, is not “Evil be to him who evil thinks”, but “Be he disgraced who thinks evil of it” i.e., of the Order. The husband of the lovely Countess (who was daughter of Lord Granston), William, Earl Marshal, was killed in the tournament at Windsor in 1358, and she died the same year. The earl was one of the original knights. At the same date Edward founded the college of St. George, consisting of twenty-six canons and twenty-six poor knights, who all required accommodation within the walls of the lower ward. The original chapel of St. George was also erected by Edward III., who pulled down the old one of Henry I., dedicated to the Confessor, and set in hand a more stately structure to receive the garter knights, which in its turn gave way to the present edifice of Edward IV. The existing Dean’s Cloister is, in part, a survival of some earlier work of Edward III. There are but scanty remains now of all this fourteenth-century building, namely, the mis-called “Norman” gateway at the Round Tower, a vaulted basement of the Devil Tower, or Edward III.’s, and the groined length of vaulting beneath the N. side of the castle, from the kitchen to King John’s Tower. Hollar’s drawing has preserved the appearance of St. George’s Hall as left by Edward III., and it was followed by Wyatville in his restoration. Queen Philippa died here in August, 1369. In the reign of Richard II. it was found that the fabric and foundations of St. George’s Chapel, though only forty years old, were in a bad state, and repairs were set in hand, the superintendent being one Geoffry Chaucer, “the father of English poetry”. The famous accusation of Henry of Bo¬lingbroke against Thomas Mowbray, Duke of Norfolk, of high treason, took place here before the King in 1398. This led to the lists at Coventry, and to action on the part of Richard that cost him his crown. He departed hence in 1399 for Ireland, and in the old Deanery (rebuilt in 1500) took place the affecting parting between Richard and his little child-wife Isabella, so tenderly told by Froissart, when he bade adieu to her, lifting her up in his arms and kissing her twelve or thirteen times. “I never saw,” says the chronicler, “so great a lord make so much of or show such affection to a lady, as did King Richard to his Queen. Great pity it is that they separated, for they never saw each other more”. Henry V. shamefully continued his detention, and it was not till nineteen long years had passed, in which the boy of eleven had grown into the man of thirty, that James was suffered to return to his own people and country. Henry VI. was called after this royal palace, in which he was born in 1421, and here he was buried. Edward IV, finding the chapel of St. George in a ruinous state, took in hand, in his thirteenth year, to rebuild it in a more noble and stately style, to which end he employed, as master and surveyor, Richard Beauchamp, Bishop of Sarum, who was allowed to make additional room by clearing away the towers on that side called the Clewer, the Berners, and the Almoners, and thus arose the magnificent structure we see at the present clay, although it was not completed till the reign of Henry VIII. Edward IV. built also, on the N. of the chapel, the deans’ and canons’ houses, as also those of the petty canons raised at its W. end in the Horseshoe Cloisters, or, as the building was then called, the “Fetterlock,” which was one of Edward’s badges, and was the name given to the keep of Fotheringhay, of similar shape. The royal tombhouse beyond the E. end of St. George’s Chapel was begun by Henry VII. as a sepulchral chapel for himself, and was granted to Cardinal Wolsey, who erected there a black marble sarcophagus for his own burial with a surrounding and canopy of magnificent bronze metal work. This building was formed into a splendid memorial chapel by Queen Victoria in honour of her lamented husband H.R.H. Prince Albert, the Prince Consort, who died in 1861 at this castle. Henry VIII. built the great gateway that bears his name, being the public entrance into the lower ward. It is decorated with his device and those of his queen, Jane Seymour, the only wife who died in charity with him, and who is buried with him. Few Sovereigns did less for architecture than Elizabeth, but she built, in 1576, the north terrace, and a gallery on that side from the royal apartments towards the deanery, now used as a library. She also erected an octagon banqueting hall at the E. end of this terrace, which was pulled down by Charles I. when he built on its site a gateway with a drawbridge leading to the Home Park. James I. lived here and employed John Norden as topographer to survey the honour of Windsor. 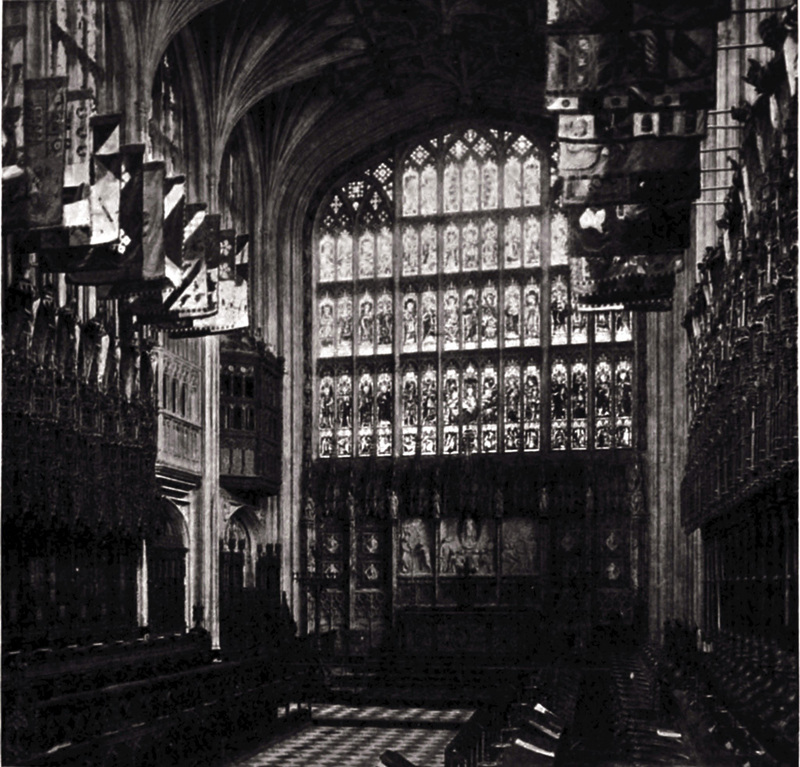 In the Civil War, in 1642, Windsor Castle was taken possession of by a Parliamentary force under Captain Fogg, who forcing open the doors carried off all the very valuable chapel plate, and despoiled Wolsey’s tomb of its gorgeous metal work, all which was sold, and the plate melted clown and coined for the use of the Parliament. They then also carried off the coat of mail of Edward IV., and his embroidered surcoat of crimson velvet worked over with gold and pearls and decorated with rubies, which had hung over his tomb since his funeral in 1483. Prince Rupert made an unsuccessful attack on the castle in that year, and during the winter Essex made it his headquarters, when it was used as a prison for Royalists. To Windsor King Charles was brought from Hurst Castle by Colonel Harrison, with a guard of 2000 men, before his final passage to London, and here he was buried on that snowy winter day, the governor not permitting the reading of any ritual. 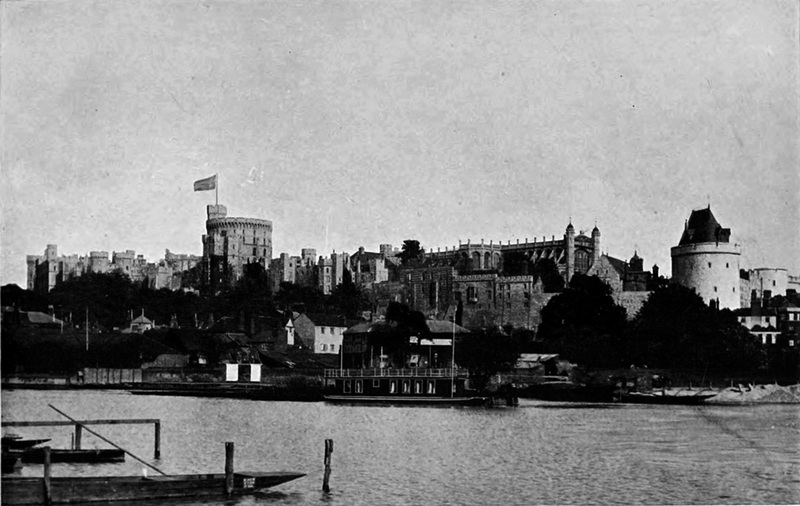 Cromwell resided here occasionally; but it was after the Restoration that the worst injury was done to Edward III.’s castle, by Charles II., who, making Windsor his regular summer quarters, sought to adapt the place to the requirements of his rowdy court and its vagaries. With the baneful help of Wren important rebuildings were begun, and if the architectural effect of these was bald and monotonous, obliterating all character, and Italianising the facade with commonplace ranges of ugly windows and pediments, the interior was lavishly decorated by the talents of Grinling Gibbons, and by the paintings of Antonio Verrio, a Neapolitan, who began to paint in 1676, and chose favourite subjects, with sprawling gods and goddesses, were “Judith and Holofernes”, and “Leda and the Swan”. The outer ditch was then filled in, and terraces were formed on the E. and S. fronts, and the N. terrace was enlarged. The Devil Tower was appropriated to the maids of honour, and Charles meant to have faced the mound of the Round Tower with red brick. William III. also designed some terrible alterations at the hands of Wren, which happily were not carried out. Queen Anne restricted her work to the park, where she planted the Queen’s Walk, and, in 1710, the Long Walk was laid out. George III. destroyed the tracery and glass in the great E. window of the Chapel. The Gentleman’s Magazine says (1805): “In 1783, by way of an improvement by an eminent architect, the whole of the beautiful tracery was cut away, and the old glass of Edward IV. removed, to give room for a large painting of the Resurrection, a daub by an eminent painter (Benj. West), and the two windows of the side aisles were treated in the same way; a like fate was intended for the W. window also”. George IV. announced his desire to remodel the castle, and adapt it to the requirements of a modern court, and the work having been entrusted to the architect Jeffry Wyatt, afterwards Sir Jeffry Wyatville, the sum of £300,000 was granted for the purpose; a commission was appointed to control generally the work, and the first stone was laid in August 1824. The rebuilding occupied four years, when the old fortress appeared as we see it now. The incongruous buildings of Charles II. were removed with their decorations, anti the castle was renewed as far as possible on the old lines, and in the spirit of the ancient buildings. One or two new towers were introduced, especially the grand entrance gateway to the inner ward, called George IV.’s, between two towers, as a fitting termination to the Long Walk. 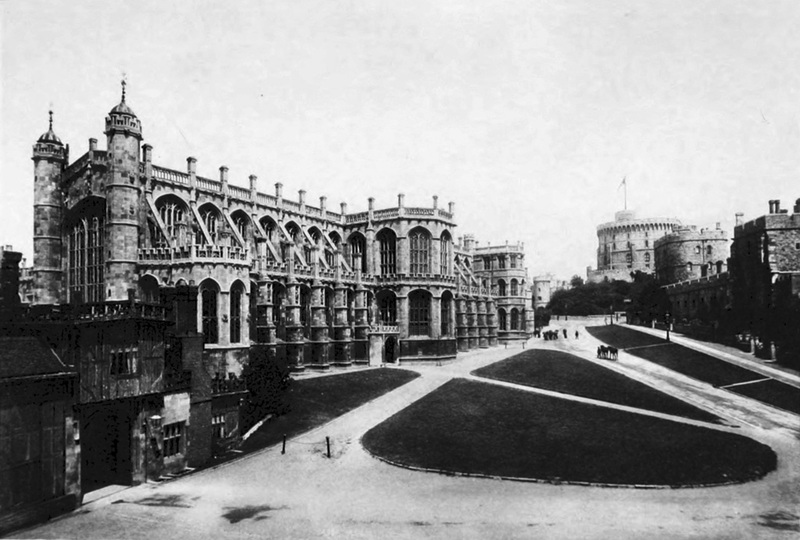 The cost of the work at that time amounted to nearly £700,000, since which time other improvements have been carried out, particularly along the wall in Thames Street; where the ancient towers, the Chancellor’s, or Salisbury, the Garter, and the Curfew, or Caesar’s, have been restored, and the line of old houses which clustered upon them and the whole face of this W. front, like limpets on a rock, totally swept away. Wyatville added 39 feet to the height of the keep, and the flag turret above the battlements. Of Henry II., some foundations and part of the lower storey from the Devil’s Tower eastward. Of Henry III., the outer curtain walls of the lower ward on the W. front with their three towers; the wall of the S. ambulatory in the Dean’s Cloister; the door behind the altar of St. George’s Chapel, being the W. door of the chapel of Henry III.’s palace; remains of the Domus Regis on the N. of the chapel, in one of the canon’s houses, and the King’s Hall, now the library of the chapter. The work of Edward III. now existing has already been given, besides the Wykeham Tower. That of Edward IV. is in St. George’s Chapel, the arcade in the aisles with their groined vaults, and the Horseshoe Cloisters, or Fetterlock, the woodwork of which was lately renewed. Of Henry VII.’s work, there are the grained vault of the the nave of St. George’s Chapel, the ‘Tudor buildings on the N. side, and the S. and E. walls of the tombhouse. Of Henry VII1., the groined vault of the choir in St. George’s and the entrance gateway. Of Queen Elizabeth’s building there remain the gallery and facade with postern at the W. end of the N. terrace. A broad flight of 150 steps was built up through the interior of the Round Tower, which has, of course, destroyed its character as a keep, from whose grated windows the Earl of Surrey gazed on the fair Geraldine, the subject of his sonnets. The last person confined here was the Marechal de Bellisle, who was captured in Hanover in the reign of George II.